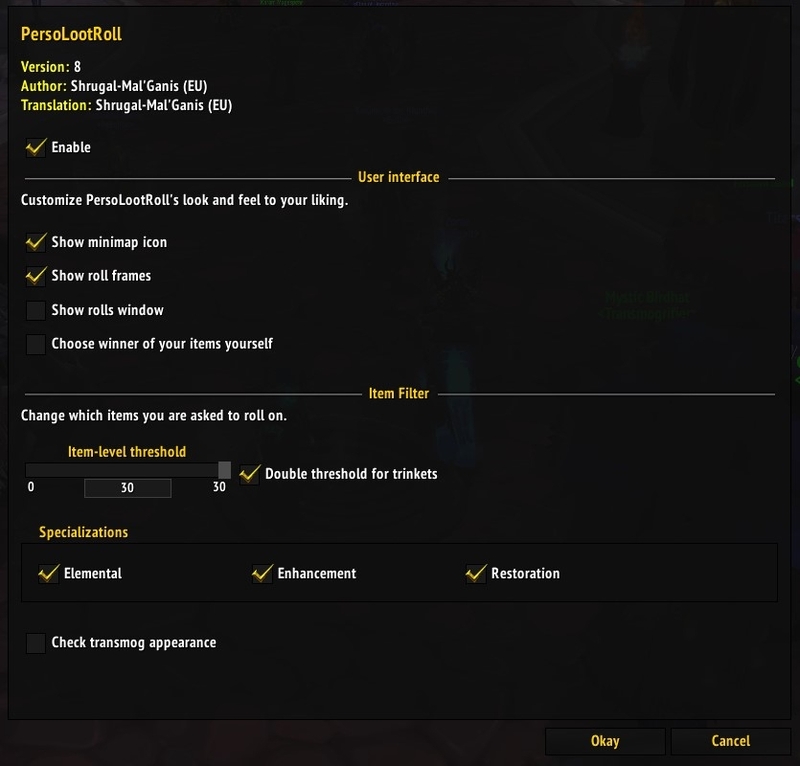 A World of Warcraft addon to share and roll on items when using personal loot. Whenever an item that might be an upgrade for you but not for the owner drops for someone in your group you will get a good old Need-Greed-Pass window (remember those? :P) to decide if you want the item or not. If you choose "Need" or "Greed", then it will send your bid to the item owner if he/she uses PLR as well, or add it to a list of all items you want (see below), so you can easily ask the owner and start trading. You can also enable whispering automatically whenever you roll on an item, with some restrictions to prevent spam. You also get a similar Keep-Greed-GiveAway window when you loot something that you can trade and your party members might be interested in. If you choose something other than "Keep" then PLR offers the item to your group, handles accepting bids via addon/roll/whisper, picks a winner and assists you in trading the item. You will get a handy list with pending actions (e.g. asking someone for loot you want, trading, awarding or voting on loot) and buttons for completing them. It will also show you recent chats with the owner or winner of an item when you hover over the "Chat" button, start following and trading the owner/winner when you click the "Trade" button and automatically put won items into the trade window. Many factors are checked before you are asked to roll on or give away an item, e.g. if it is or should be tradable, what you and others have equipped, class restrictions, trinket type, and so on. It will only ask you to decide when it actually makes sense, while making sure that you don't miss any loot you might be interested in. It works great for randomly giving away loot in PUGs and organized groups, but it also has a masterloot mode where one person decides who should get which item. The masterlooter can also configure things like custom answers and a loot council. Just about everything can be easily tweaked in the options menu. This includes whether or not to send messages to other players and customizing them, what items are considered "useful" (e.g. only certain specs or transmog missing) and which parts of the UI you want to see. See this Wiki page for details. This includes the popular loot roll addon Personal Loot Helper, Pawn to only roll on stuff that actually has your preferred stats, and EPGP to give away loot based on PR value or credit GP for awarded items. 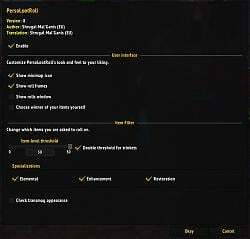 The core idea of PLR is to make sharing loot as easy as possible by reusing the group-loot roll windows that have been in WoW since Classic, and making them work for Personal Loot as well. 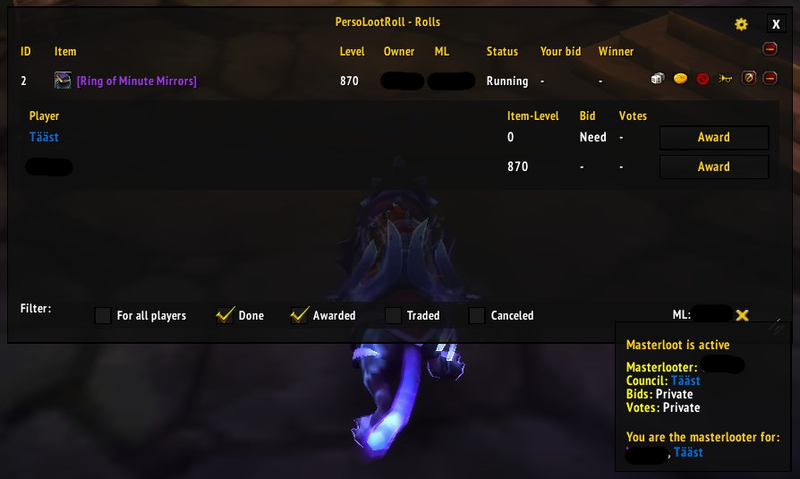 If the owner uses PLR as well, then it sends him/her your bid as an addon-message in the background, waits for the roll to end and adds a trade entry to your actions list if you win the item. If the owner doesn't use PLR, then it checks whether the item link has been posted to group chat (e.g. "[item-link] roll") and /rolls for it if that is the case. 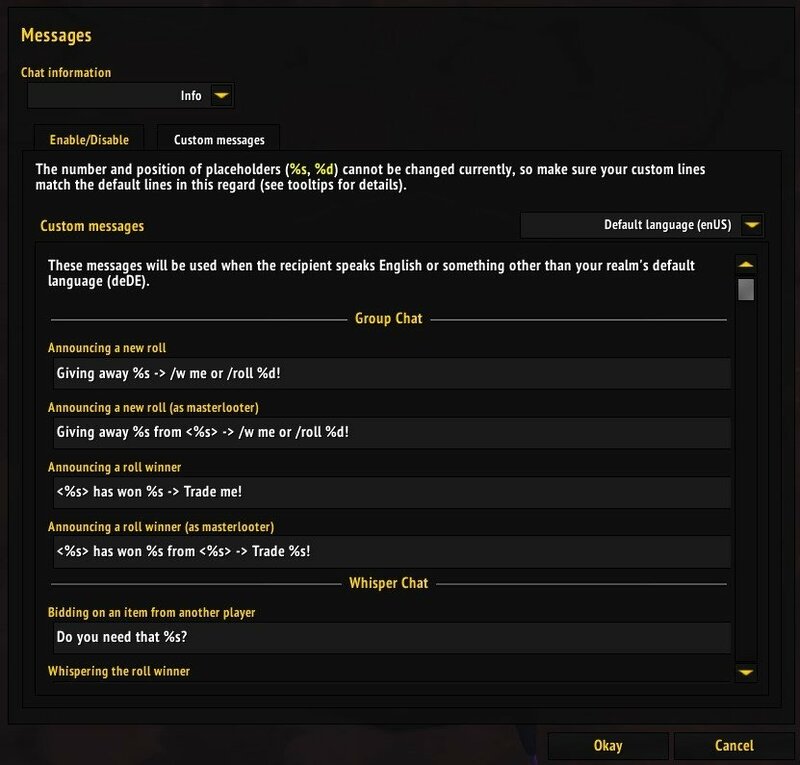 If it hasn't been posted yet then PLR adds an entry to your actions list to ask the owner for the item, and if you enabled "Ask for loot" and the owner hasn't been asked by two other PLR users already then it will also send a whisper message to the owner reading "Do you need that [item-link]?". Send an addon-message to other PLR users, so they know that the item is up for trade. If there are players not using PLR in your group, then it will also post an advertisement to chat reading "Giving away [item-link] -> /w me or /roll 101." This number "101" at the end will count up for every item currently being given away by you or other PLR users, so the next item advertisement will be /roll 102, then 103 and so on. This way multiple rolls can happen in chat at the same time. PLR will then accept bids from other players in the form of addon-messages from other PLR users, whisper messages or /rolls in chat. Your party members can /roll 100 if your item was the last one being posted to chat, and they can also subtract 50 to indicate a "Greed" roll, so /roll 50 instead of 100, 51 instead of 101 and so on. 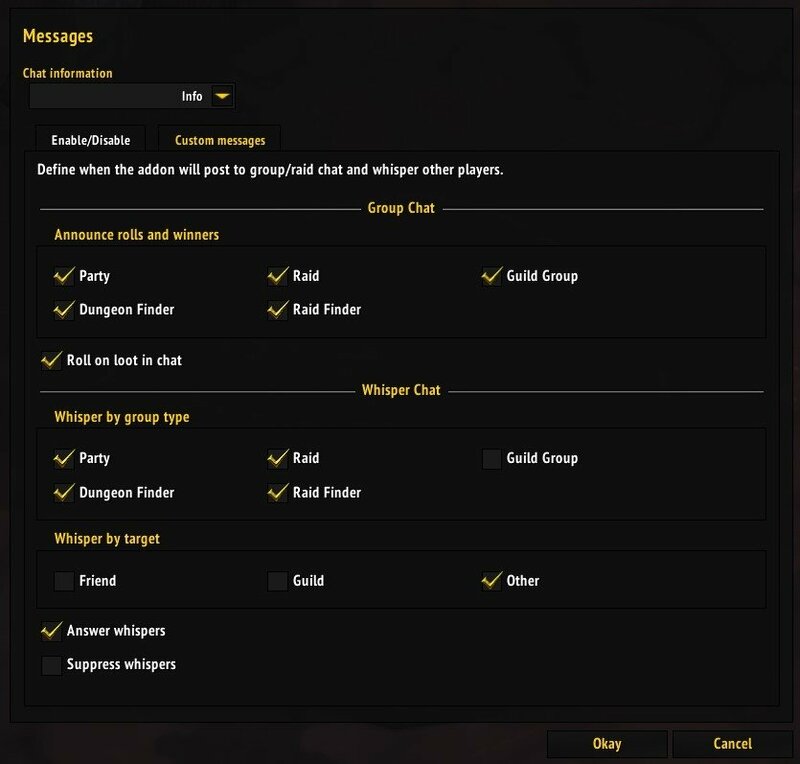 You can also choose to automatically suppress and/or answer incoming whisper requests. After a few seconds (depending on the number of looted items) the roll ends and PLR picks a winner, posts the result to group chat, whispers the winner and adds a trade entry to your actions list. When you click the "Trade" button in that entry PLR will start following the winner (if in range), open a trade window and put the won item into the window, so you only have to click "Accept". You can open the overview window by clicking on the minimap icon, and then search for or become a masterlooter by clicking the button in the lower right corner. When you decide to become a masterlooter other PLR users in your group will get a message, asking them to accept you as their masterlooter. If they accept, then all loot they get will be distributed by you, so other players' bids on items will go to you, and once a roll has ended you can decide by hand who should get it. The item owner will get an entry on his/her actions list and a notice in chat, instructing him/her to trade the item to the winner. As a masterlooter you can also define custom bid answers and declare other players as your loot council, so they will see bids as you do and can vote on who should get the loot. More details on how to customize the masterloot mode can be found on this Wiki page. Use /plr or /PersoLootRoll to open the rolls overview window, manually start rolling for items in your bag etc. If you want to help translate it to your language or correct translation errors you found then please visit the Curseforge Translation section and also check out this wiki page for some tips. Please create a new entry on the bug tracker or feature tracker if you encounter any bugs or want to suggest a feature. You can also post little things here in the comments, but it will probably take a bit longer for me to see it and respond. You can vote on feature request here. Click on the "Donate" button if you want to support the development of this addon or just buy me a beer. Always appreciated, never required! Great find, thank you. The problem was that the file is called lib.xml, but I wrote libs.xml (with an s) in the "Include" tag. :P Glad to hear the addon now works for you, I will fix this for the next version, hopefully it's out today or tomorrow. When trying to get members of our guild to install the addon so we could test it out some of them had problems with getting the addon to work. alot of them got it to work no problems at all. even me. it worked out of the box. Message: Interface\AddOns\PersoLootRoll\Addon.lua:11: Cannot find a library instance of "LibDBIcon-1.0". after doing some digging into my addons and them working. i was able to find out. in their addons with no other addon calling for LibDBIcon-1.0 or having it installed. or well. we did that and their addon now loads and works as it does for me. no idea if this is a hax job but just thought i would let you know what i did to make it load for someone. and that it works fine for me without needing that fix. Anyways. 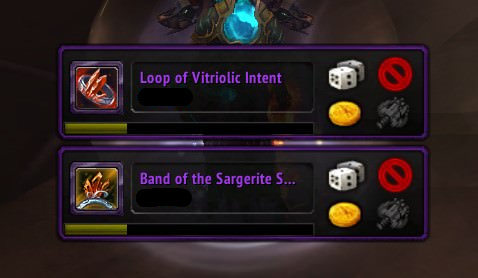 nice idea for a BFA loot addon. just been trying it out in our guild raids as we use to use a masterlooter addon "Konfer (Suicide Kings)"
Last edited by wagg1 : 06-29-18 at 04:04 PM. Thanks guys, this means a lot to me. Just want to show my appreciation for this addon, this has already greatly helped me gear some alts. Seeing what's an upgrade so easily and visibly is brilliant. With the option to whisper people & organise rolls so easily is something i've been after for a long time. Thank you for such a great addon and execution, keep up the good work !